QUE : EXPLAIN ADDITION REACTION AND ALLYLIC BROMINATION ON ALKENE ? ANS : 1 Alkene gives addition reaction with bromine i.e.bromine gets add on each double bonded carbon atom. addition reaction of bromine with alkene is proceed via cyclic intermediate and give trans product. 2 allylic position is the carbon atom next to the double bonded carbon atom. REAGENT for allylic bromination NBS (N-bromo succinimide) is generally used . QUE: WHY ALIPHATIC AMINES ARE MORE BASIC THAN AROMATIC AMINES ? ANS : In aromatic amine like aniline lone pair of e's which are responsible for basicity are involve in resonance with pie electrons of ring hence not easily available for protonation . But in aliphatic amine lone pair is fully available for protonation .Hence aliphatic amines are more basic than aromatic amines . QUE: ETHYL ALCOHOL HAS HIGHER BOILING POINT THAN DIETHYL ETHER ? 1:Between methyl alcohol and ethyl alcohol. ans: ethyl alcohol gives a yellow crystalline precipitate of iodoform with alkaline iodine solution while methyl alcohol does not. ans: 1-propanol is a primary alcohol and does not react with lucas reagent(ZnCl2/HCl) or only react upon heating. 2-propanol. is secondary alcohol and react with lucas reagent after some time (5 min) to form an alkyl halide which being immiscible in 2-propanol.forms cloudy liquid. 3: diethyl ether and n-butyl alcohol. ans: n-butyl alcohol reacts with sodium to give bubbles of hydrogen gas due to its OH group.diethyl ether does not react with sodium as it has no OH group. ans: 1-butyne reacts with ammonical cuprous chloride to form red precipitate but 2-butyne does not have acidic hydrogen hence form no ppt. 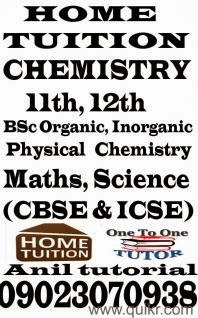 QUE: WHICH AQUEOUS SOLUTION HAS HIGHER CONCENTRATION ; 1 MOLAR OR 1 MOLAL HAVING SAME SOLUTE? volume of solvent is less compare to 1 molal so 1M solution is more concentrated. QUE :WHAT IS FAJAN'S RULE AND HOW IT HELPS TO PREDICT COVALENT CHARACTER OF MOLECULE? ANS: fajan rule " smaller the size of cation greater the size of anion more is covalent character". fajan's rule helps in predicting covalent character of molecules. e.g out of SnCl2 and SnCl4 which is covalent in nature ? in SnCl2 Sn is in +2 O.S and SnCl4 is in +4 so due to smaller size of cation in SnCl4 it is covalent in nature. QUE : WHAT IS INERT PAIR EFFECT ? ANS: the reluctance of participation of ns electrons of heavier elements in a chemical reaction is called inert pair effect. CAUSE OF INERT PAIR EFFECT :we move down the group their is involvement of d and f orbitals as they have poor shielding effect so there is increase in effective nuclear charge on the outer electrons . this result in more nuclear pull on valence electrons . since s orbital is closest to nucleus so s electrons are maximum attracted by nucleus and decrease its reactivity in chemical reactions;. CONSEQUENCES OF INERT PAIR EFFECT as we move down the group compounds occur in low oxidation states. +3 due to inert pair effect. QUE :WHAT IS CANNIZZARO REACTION ? ANS; This redox disproportionation of non-enolizable aldehydes to carboxylic acids and alcohols is conducted in concentrated base. QUE : WHAT IS LANTHANIDE CONTRACTION ? Ans : the decrease in ionic radii of elements in lanthanide series from La (57) to Lu (71) is called lanthanide contraction . 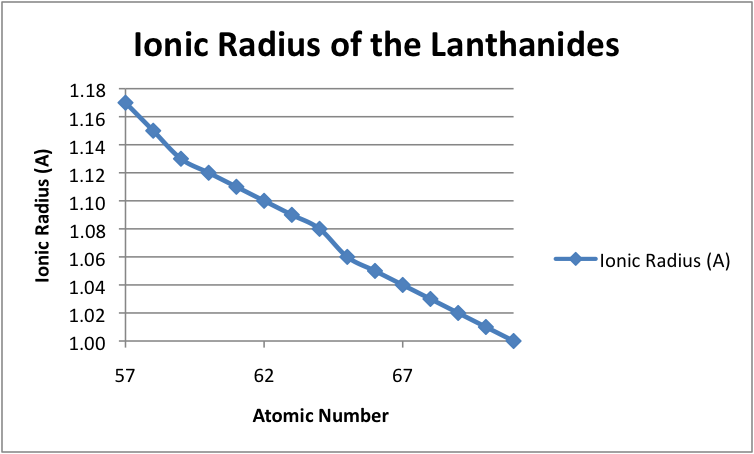 REASON : The Lanthanide Contraction is the result of a poor shielding effect of the 4f electrons. 1. elements of 4th row containing 4d and row 5th row containing 5d have very similar sizes .